More results from our fun day of transparency work. 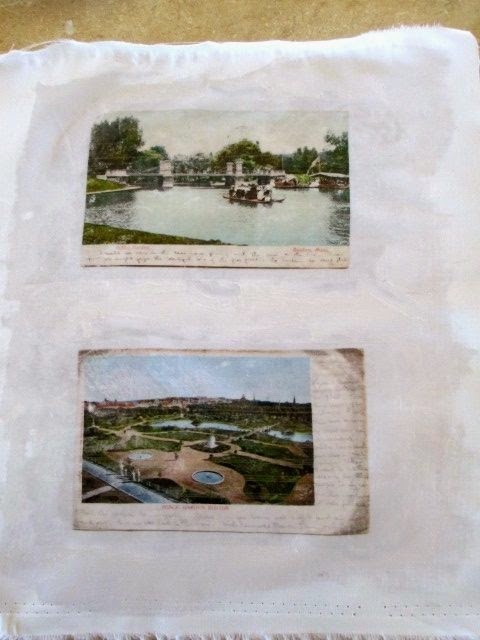 Denny used her own transparencies and had her images printed on them when she arrived. 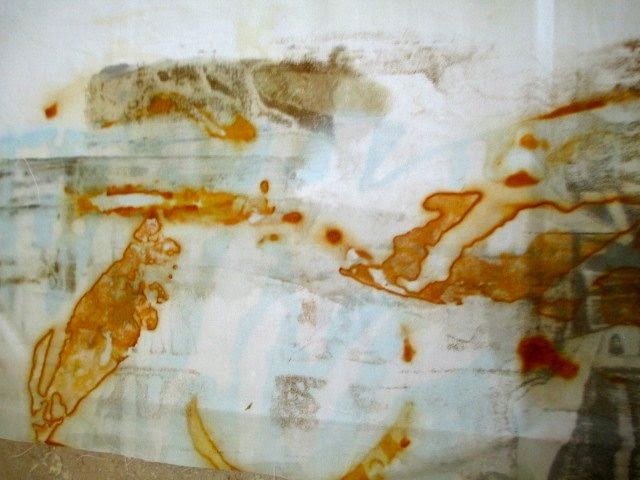 She used a different transparency - an all purpose one and the results were not quite as good as the ones designated for an inkjet. I think the transparency has a lot to do with the results and we probably need to do more experimenting. 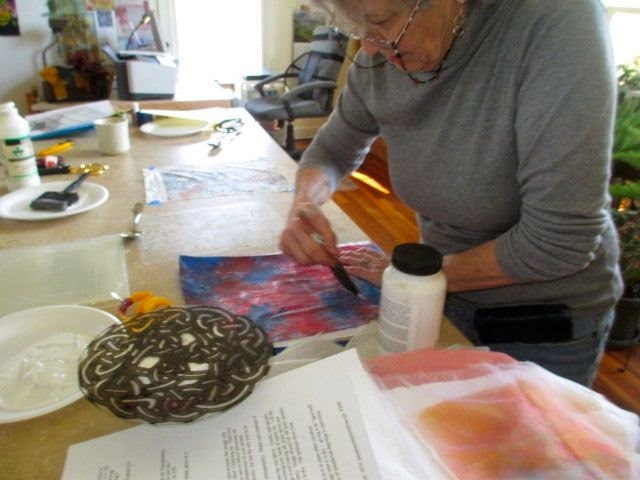 Denny is brushing the fabric with an acrylic medium..
and here is the transparency she transferred onto a mottled fabric. I like the way the fabric shows through. 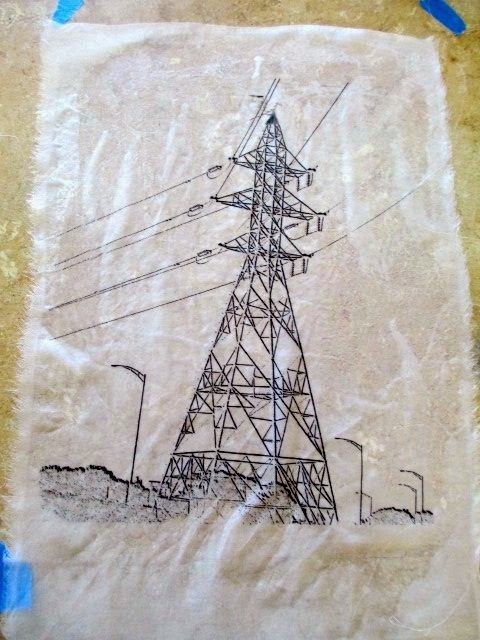 and her transfer on organza. 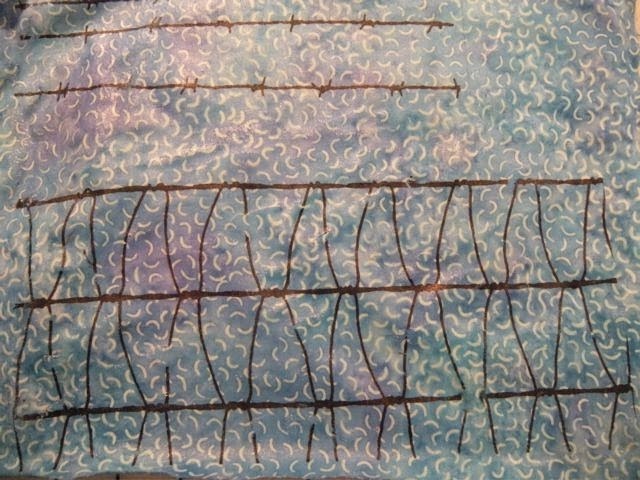 When transferring onto a sheer, place another piece of fabric underneath as the sheer is too thin to absorb all the ink causing it to smear underneath. 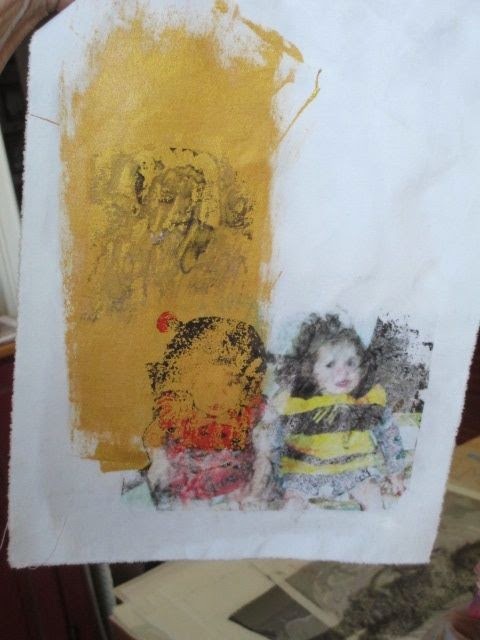 This extra piece can serve as a dual purpose as the excess ink will be caught by the fabric underneath - not as strong a print, kind of like a ghost image but really interesting. 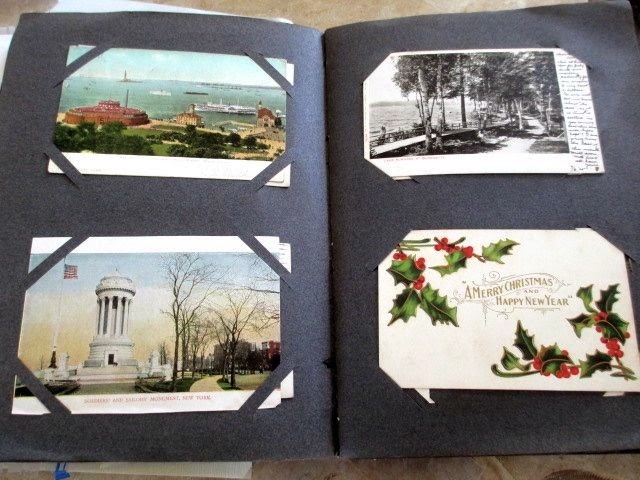 Gen brought a wonderful treasure - a whole album filled with old postcards...all were used and mailed so there was writing on each one. Many of them were over 100 years old. Her transfers using color were very successful. We had to remember to reverse the image first in a photo editing program in order for the writing to transfer correctly. I loved this next postcard...@ 104 years old. This card could not be sent through the mail as is, open for everyone to see. 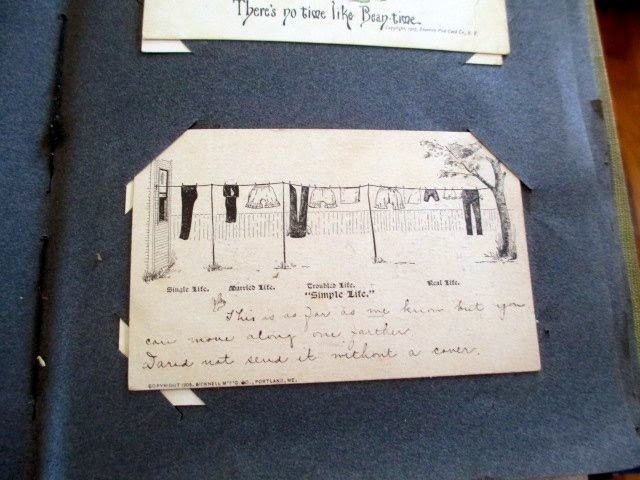 It was censored and had to be placed in an envelope, the reason being - there were ladies' "bloomers" on the clothesline. 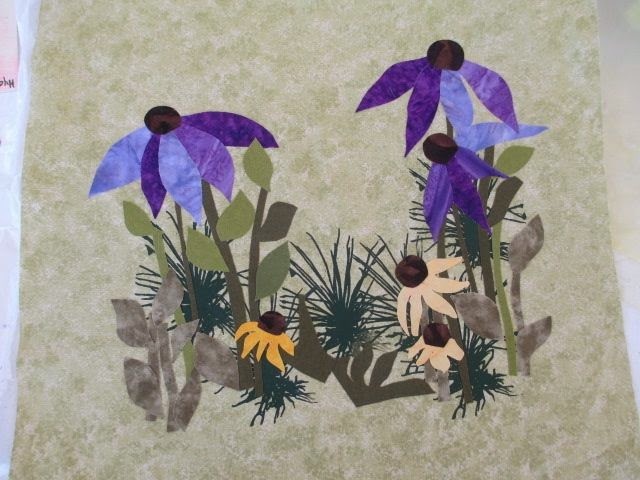 The pieces are a little stiff as a result of using the medium but you can iron them on the wrong side to flatten and used in an art quilt, work very well. 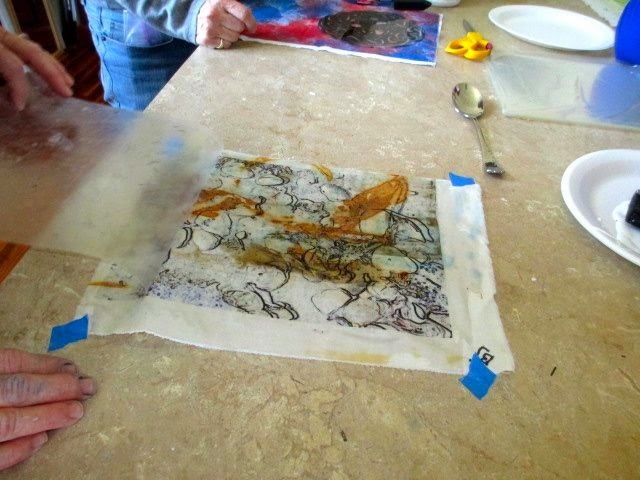 Kate had great success transferring to silk organza. 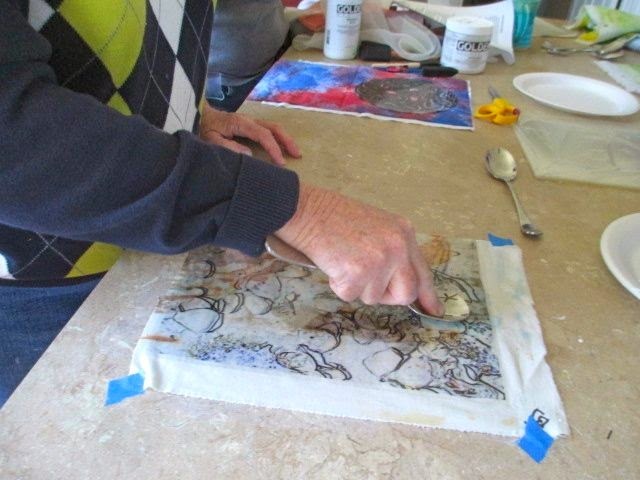 Our Fiber Junkies meeting this month was to explore the transfer of images through transparencies and the use of an acrylic medium. This was such a fun, easy technique which yielded quick and successful results. 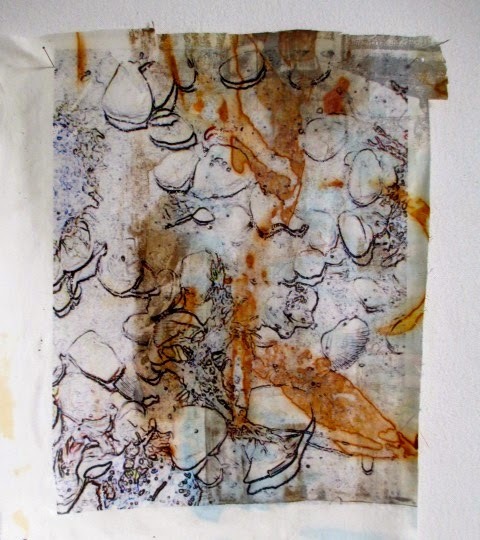 Everyone brought images they wanted to transfer onto fabric. 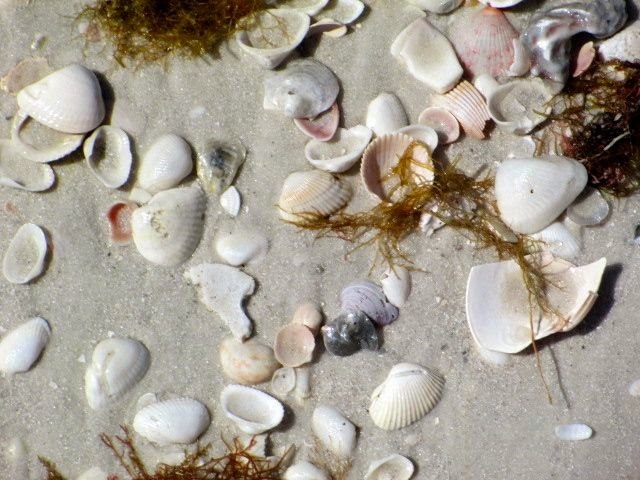 My recent trip to Florida provided many photo opportunities. 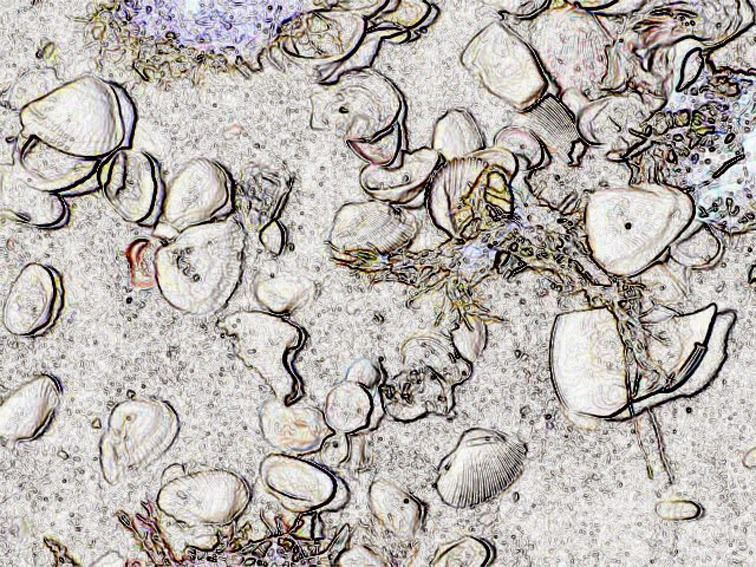 I used transparency film I had on hand for this technique - tried many years back. 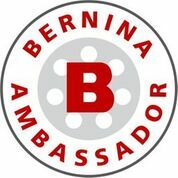 If you're wanting to try this technique, it's good to use film made for an inkjet printer; you do need to print the image using an inkjet - a laser won't work. 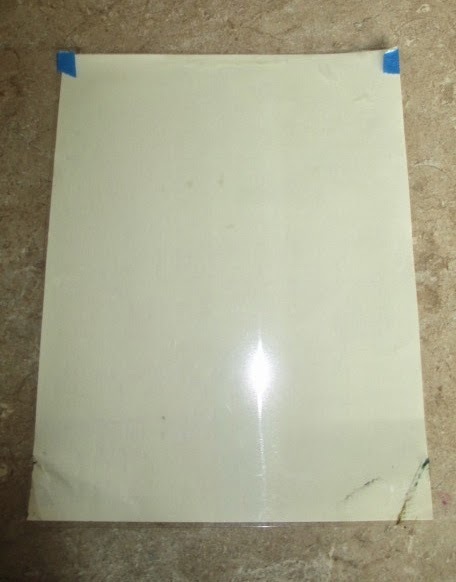 Make sure the film does NOT say "quick dry" - that won't work either as the ink won't release from the transparency. 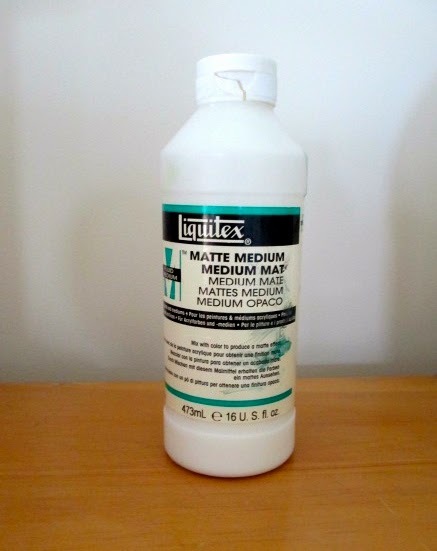 We all found the film made specifically for inkjet works better than all purpose. and it went through the printer easily. Here is the transparency with the image printed on it. 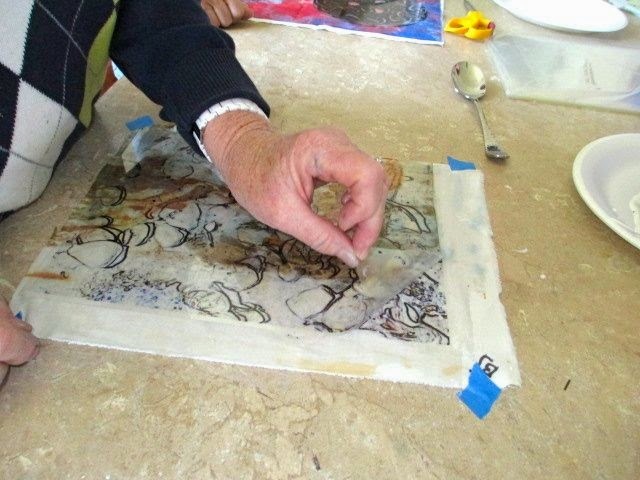 When using an inkjet, images on a transparency can be saved for months and used for this process at a later time. 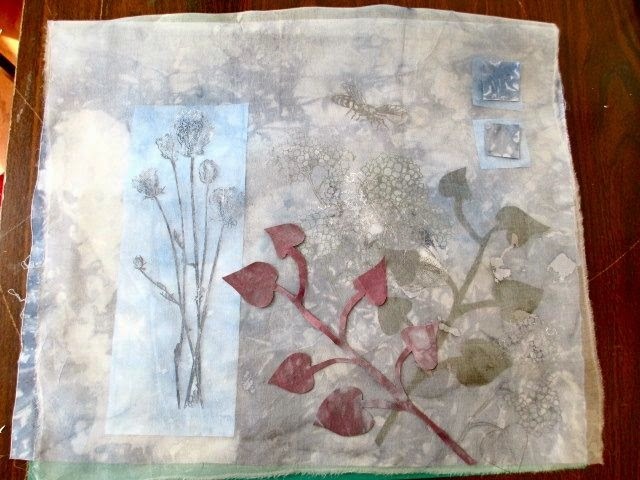 Next was to choose a fabric to transfer image to. If it is a line drawing, a fabric with some color movement will show through the lines and be more interesting. I picked a fabric I had dyed and rusted. 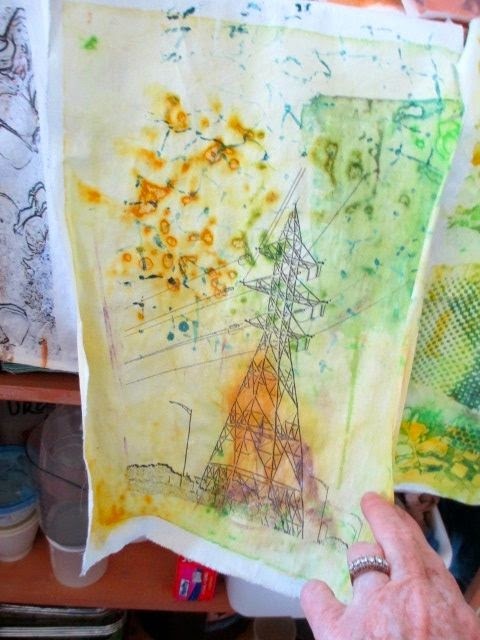 The nice thing about this technique is that you can preview it first by laying the printed transparency over the fabric before transferring. 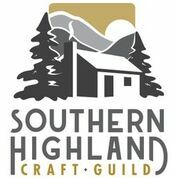 We used any acrylic matte medium found in all art stores and craft stores as well. Using a wide foam brush, we brushed it liberally over the surface of the right side of the fabric - enough to just wet it. 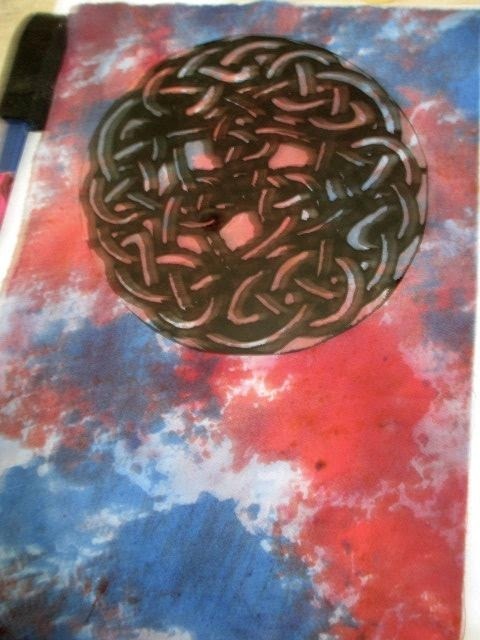 We laid the transparency, print side down to right side of fabric and started to burnish it. 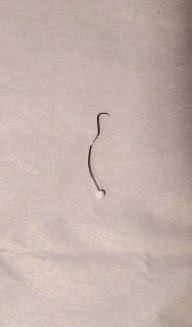 We used the back of a spoon and made little circles while applying light pressure. It transfers pretty quickly and you can check by pulling up a corner. The ink should be on the fabric and the transparency clear. Pulling off the transparency is the most fun part. You can see how clear it is - far left, making it a successful transfer. Let dry and iron on wrong side. There were some wonderful results which I'll share next time. 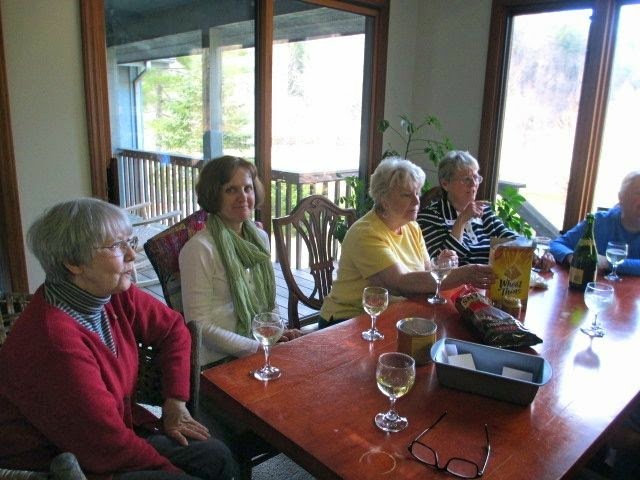 Yesterday we met at my home for our monthly meeting of Fiber Junkies. It was a very lively, fun and productive day. 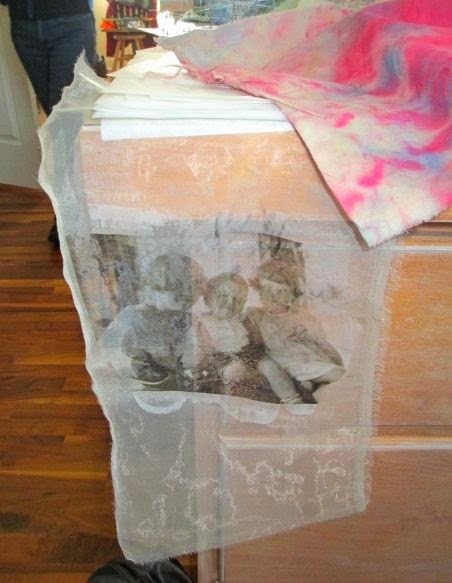 Our project for the day was to explore the use of transparencies as a way to transfer images to fabric (more on that tomorrow). 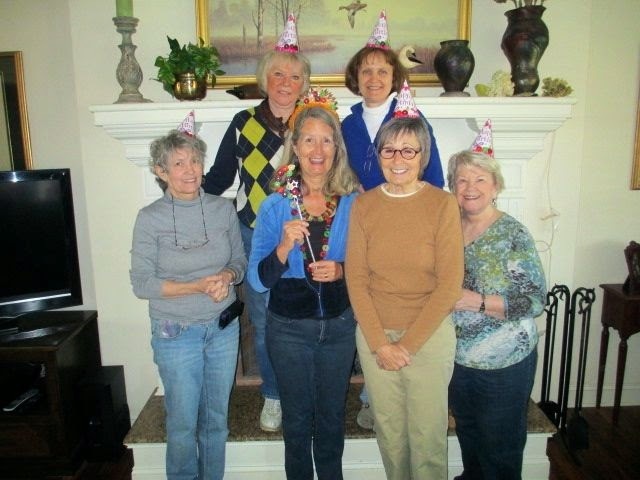 We also celebrated a special birthday for one of our members who was away in Florida at the time of her birthday. 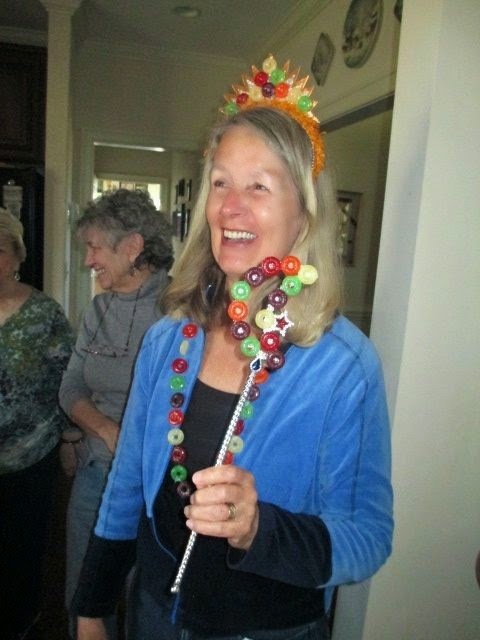 We had a surprise "Lifesaver" party for Val. So why Lifesavers?... 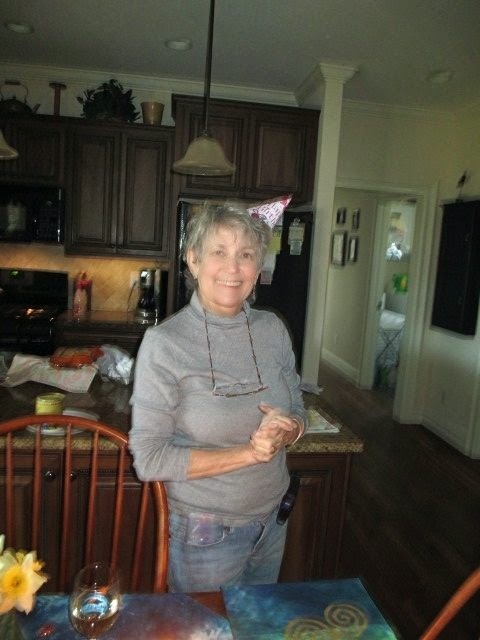 I remember Val telling me about a favorite aunt who could sew anything. When Val was little, she made her a beautiful blue dress for her birthday...the fabric had Lifesavers on it. So the idea was born - to have a Lifesaver party. 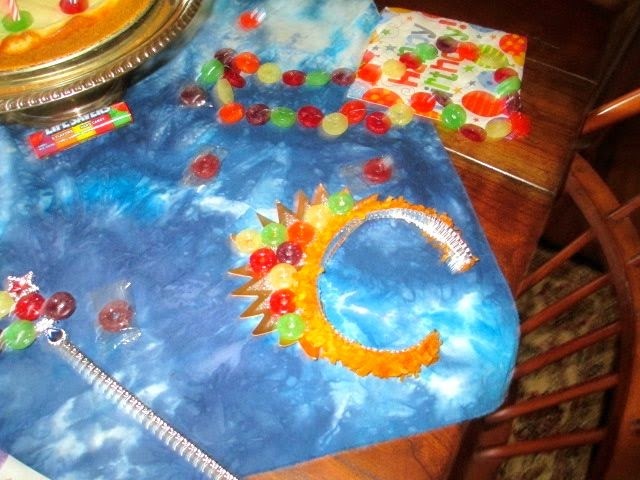 I dyed blue fabric for the tablecloth and sprinkled life savers on top. 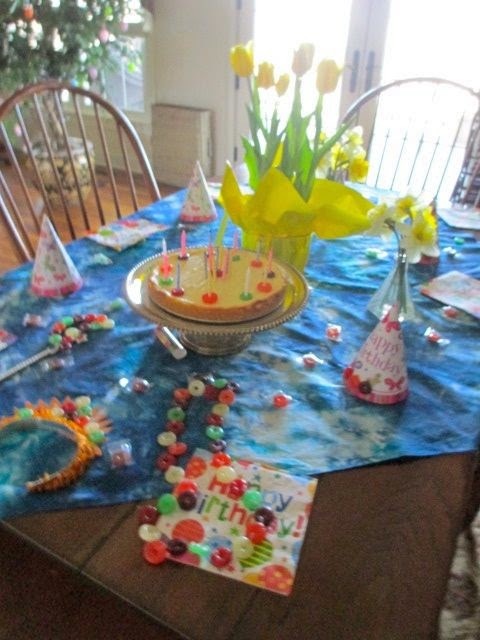 Kate decorated party hats with Lifesavers. 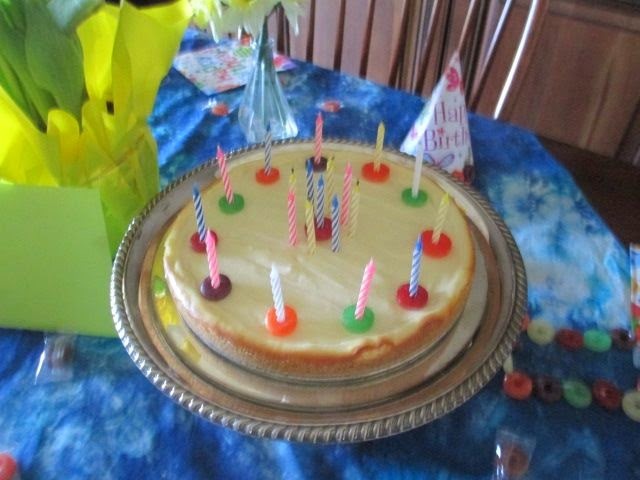 Mary also made a yummy cheesecake with Lifesavers. A Lifesaver scepter and crown from Kate, a Lifesaver necklace from me, Gen made one also and Denny made a Thermofax screen featuring Lifesavers - can't wait to see how Val uses that. 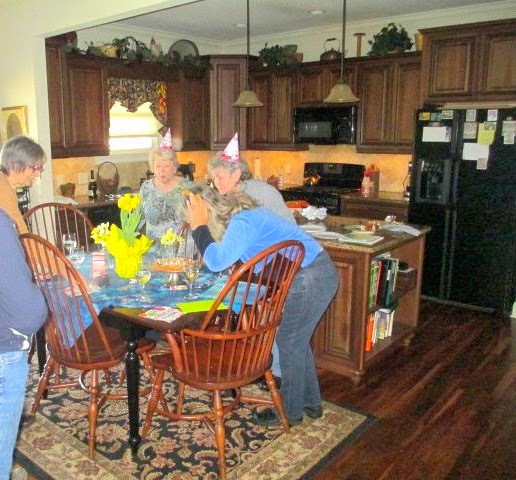 The surprised and happy birthday gal. 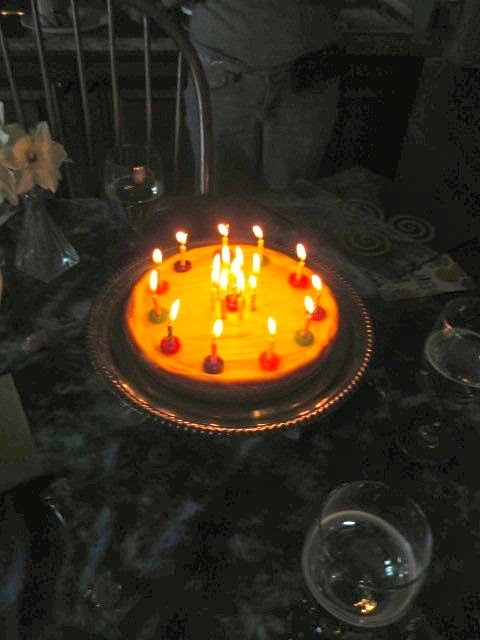 and time for the lighting of the candles. My husband was on hand to get our picture. 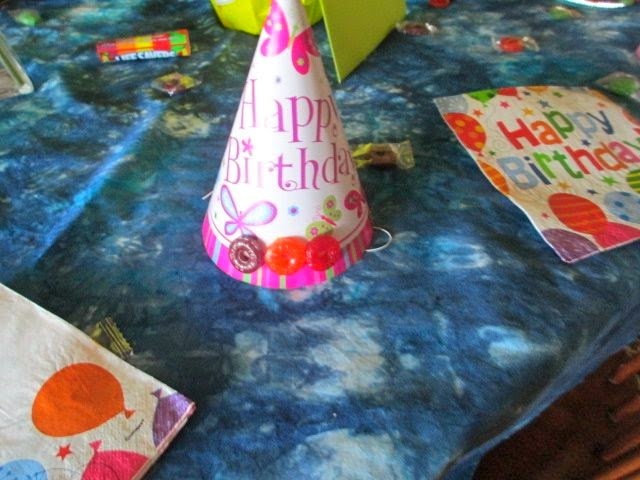 We had such fun planning this party. Stay tuned for what we actually did at our meeting, it was great fun. 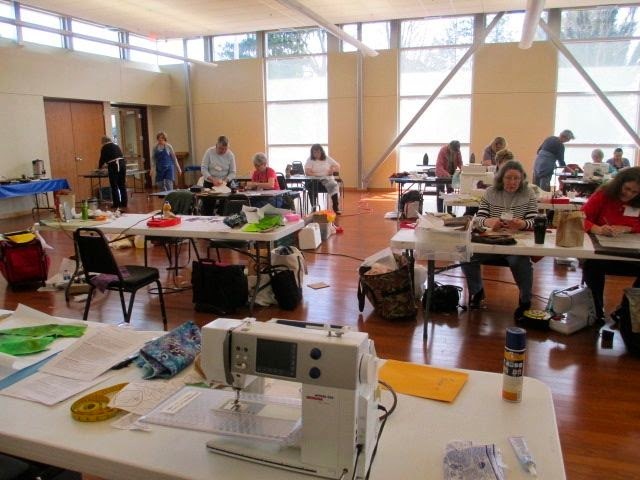 I taught one of my favorite workshops to the Asheville Quilt Guild this week; it is such a fun workshop as you see so many different pieces and directions from students. 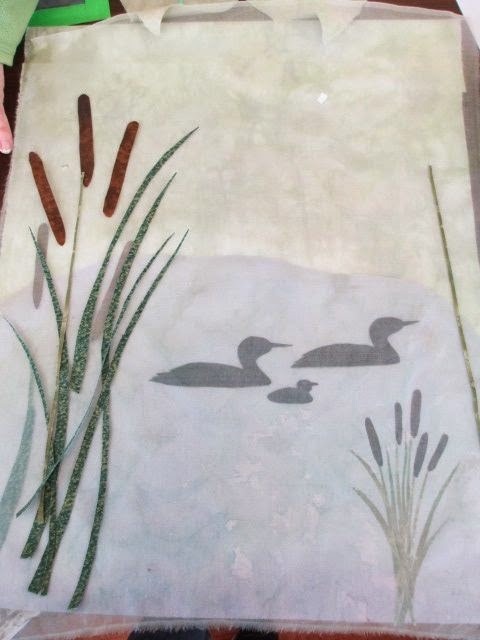 It was a design workshop using a base fabric, creating nature type motifs for that layer, and painting a sheer layer to place on top using more design elements. You get a great feeling of depth to the piece. There is a lot more to it but this is the starting point. The workshop was full and we had a huge, well lit room for working, this is only half the room, the other half had as many tables and people. It was a teacher's dream for teaching. I went around snapping pictures and unfortunately wasn't able to get everyones. Their piece wasn't up to the point of being photographed, or design elements were still being placed. 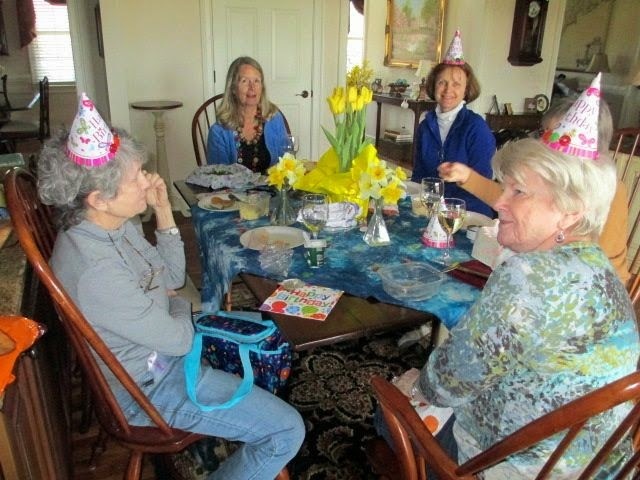 Each piece was so individual and interesting, beautiful, restful - the list goes on to describe the works of this very talented group of ladies. This first piece did not have the sheer layer as yet. 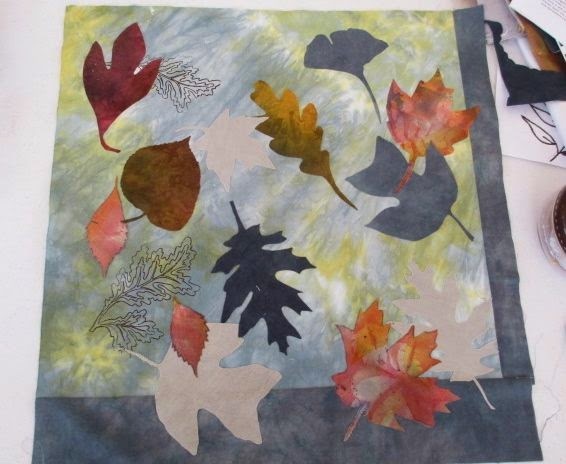 It was to represent a forest floor with leaves laying where they fall. It was lovely and I can't wait to see it finished. This gal only had the bottom layer finished when I snapped the picture. Before she left, the sheer layer was ready to place on top. 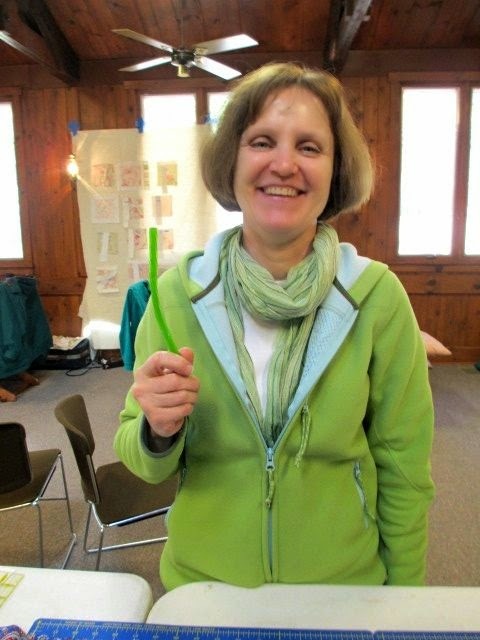 The "weed" like imagery in the background was done with silkscreen - another skill learned in the workshop. 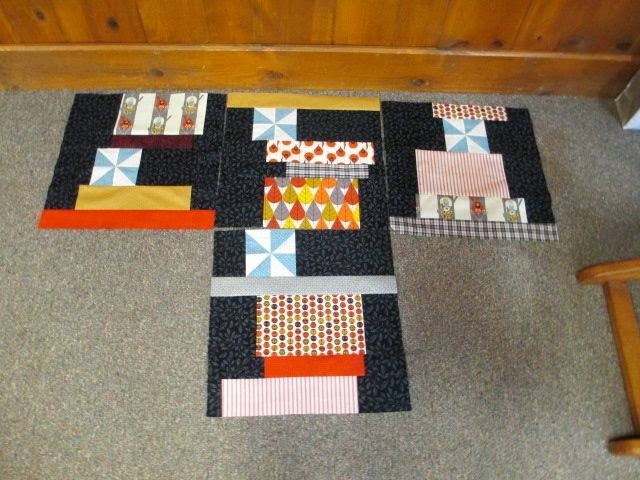 This was the start of a beautiful piece and I remember her telling me, she had only been quilting for a year. I think we have a star in the making. 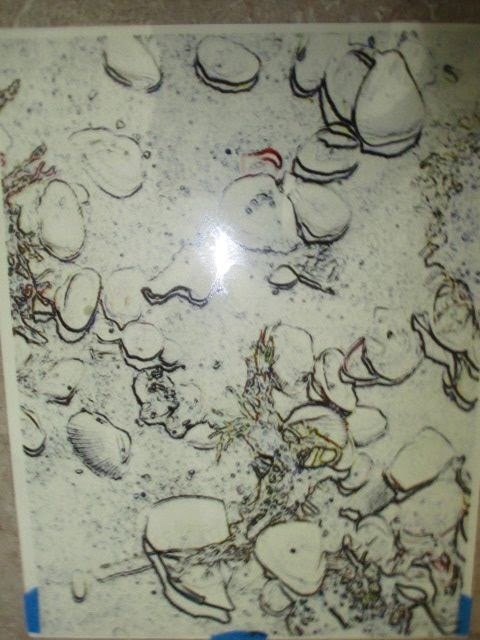 Betty created this piece which was her design. She wanted to use lunes and cattails. The sheer is already in place and you can see the dimension it creates. Some of the cattails are on top and some beneath the sheer. She plans to go and add more elements in the foreground along the bottom. It's wonderful! I absolutely loved this piece. The mushrooms were hand painted after being silk screened on - what a clever idea. The dragonfly was a screen also. 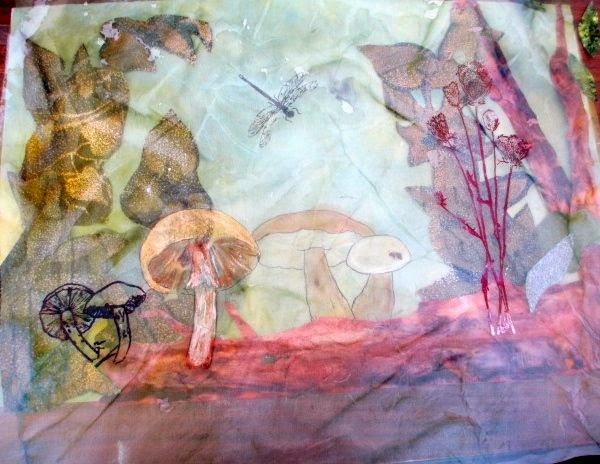 The sheer layer add more dimension and the mushroom screened on organza was also painted. This piece started with a very lively background which worked beautifully in the design. 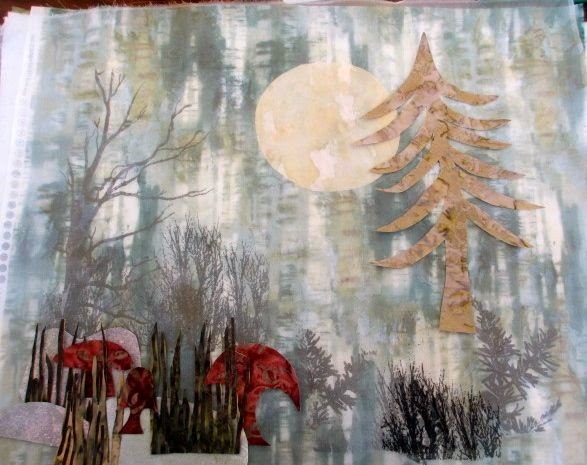 The tree and "brush" was screened on the background and more design elements added to the organza in front. 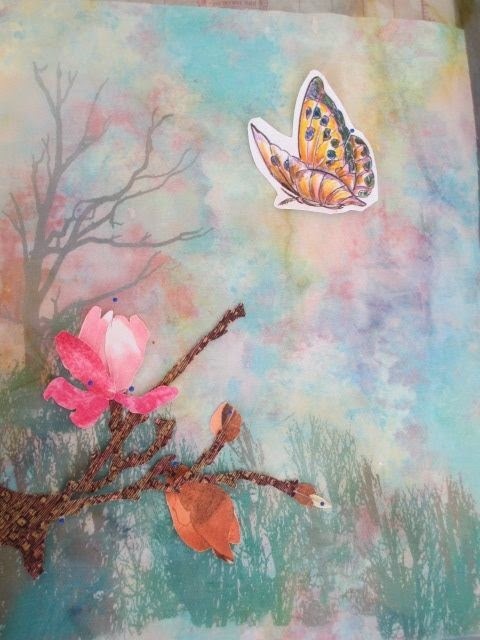 The butterfly (which still needs to be cut out) was one she also hand painted before coming to class. 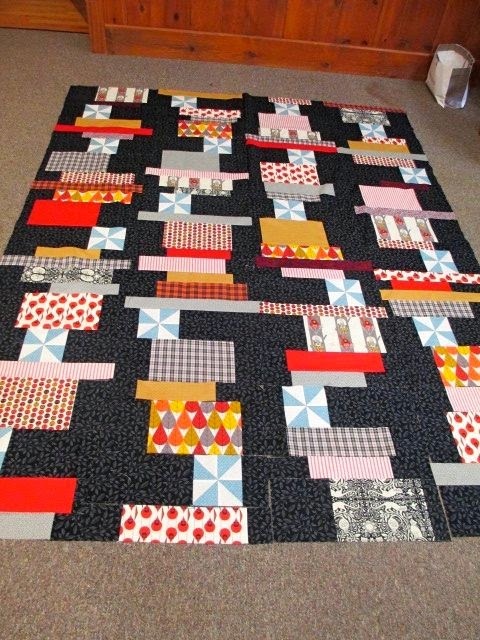 We all fell in love with the background fabric in this piece - it's a Hoffman and I looked it up on line, still available but finding the store that carries it is another issue. The fabric was placed with stripes going vertical to give the illusion of trees - how clever is that. The elements on the organza really made the piece pop. This was Peggy's piece. 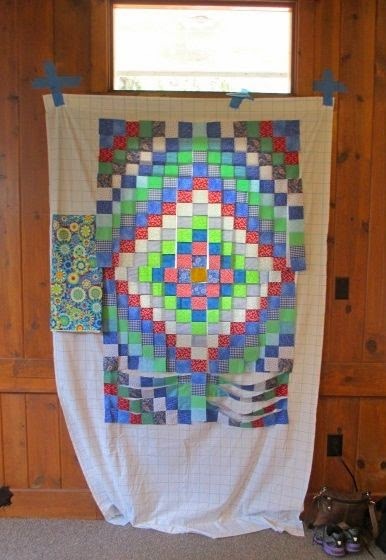 She worked with squares and silk screen and smaller squares in the upper right corner to balance it out. She also screened lots of Hydrangeas onto the background which show through and are very effective. 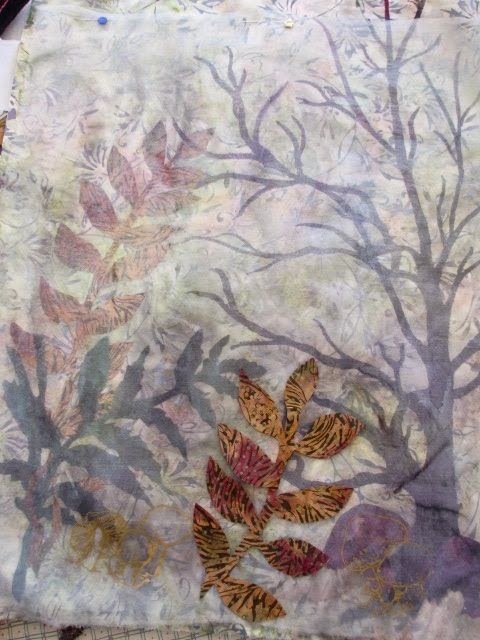 This was Chris's piece - she started with a medium value batik as the background and screened a tree off to the side. 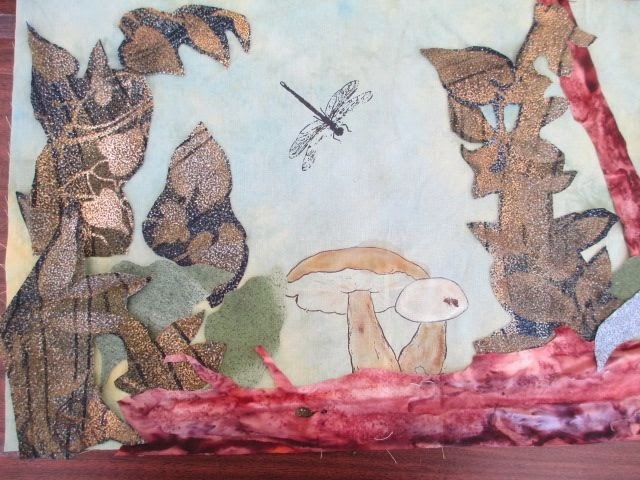 She added ferns to the background and still in the process of added more to the organza. ..another great piece. I have to say, my one regret is not being able to photograph all of them - there were twice as many as you see here and all so unique. I promise my ladies if they send me a picture, I will put it on my blog. I am so proud of this wonderfully talented group and want some bragging rights for them. 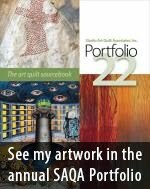 This workshop is a delight to teach, I come home on such a high after seeing the art people are able to create. 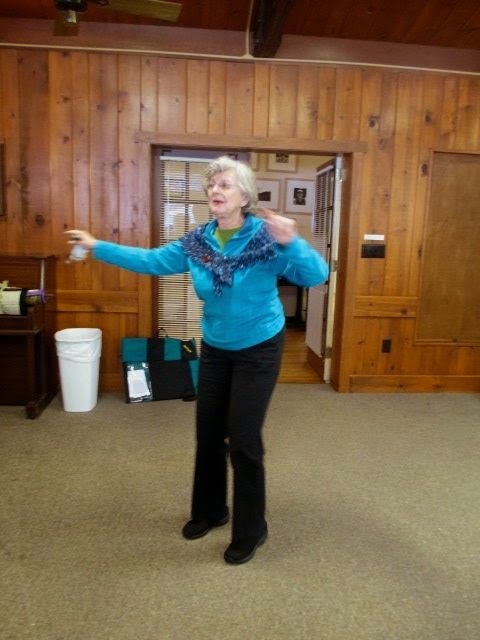 I just returned from our 7th annual PTA retreat - great fun as always....Some of the highlights. 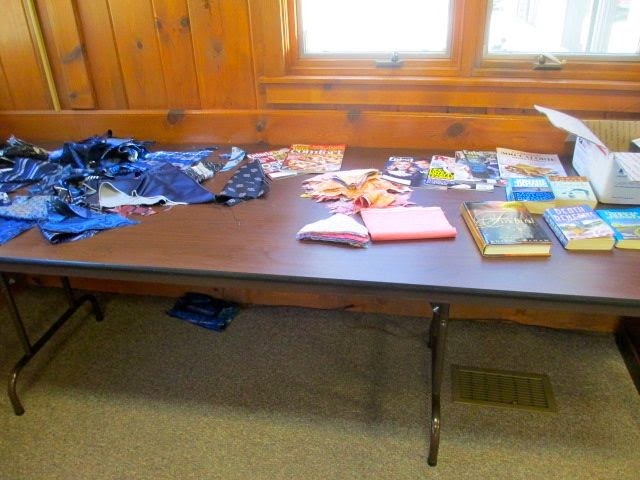 Our "freebee table filled with fabric, books to read, and magazines that need a good home. Wonderful snacks including twizzlers to match our outfits. 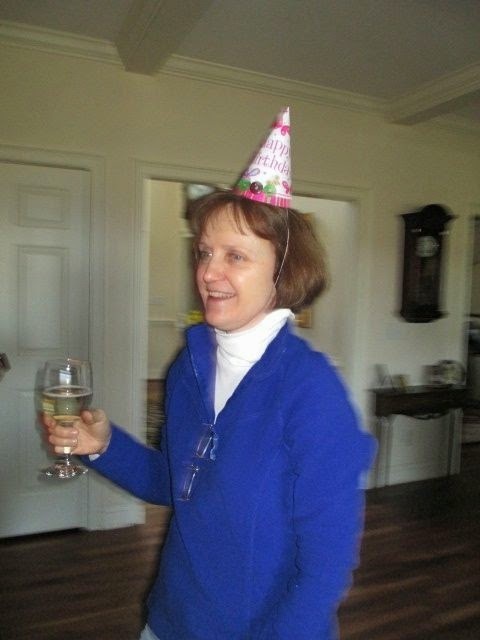 such as Leigh Ann's. It's really fun to see in person and utilizes a great technique for construction. 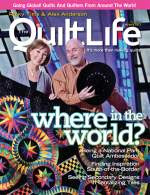 Kate's Trip Around the World, only 1 of 2 quilts she worked on - Kate is a super fast piecer. 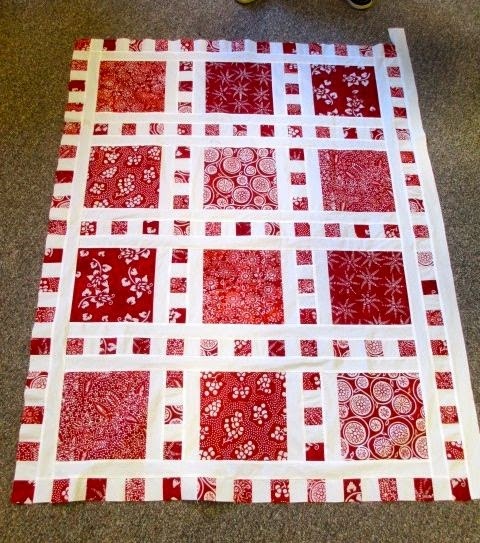 Gen's wonderful red and white quilt - very striking. 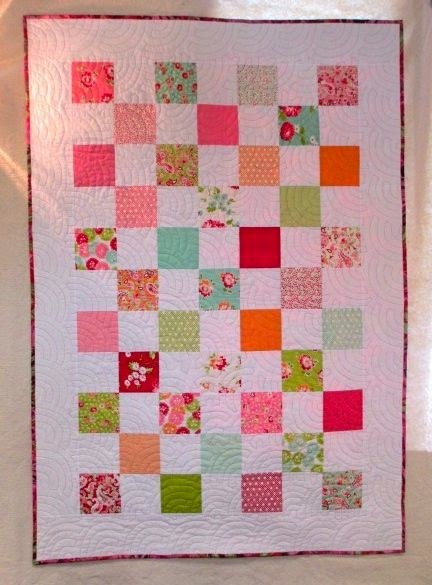 Lynn made the top for this lovely quilt; it just needed binding. 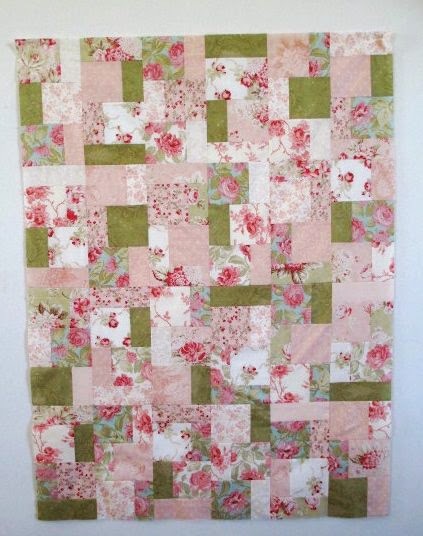 She used pre-cut Moda fabric squares and they worked like a charm. 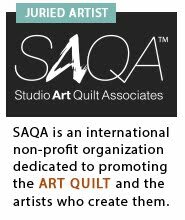 I had a couple of quilts in the works all of them using this line of Moda I purchased many years ago. It still needs a border and then quilting. 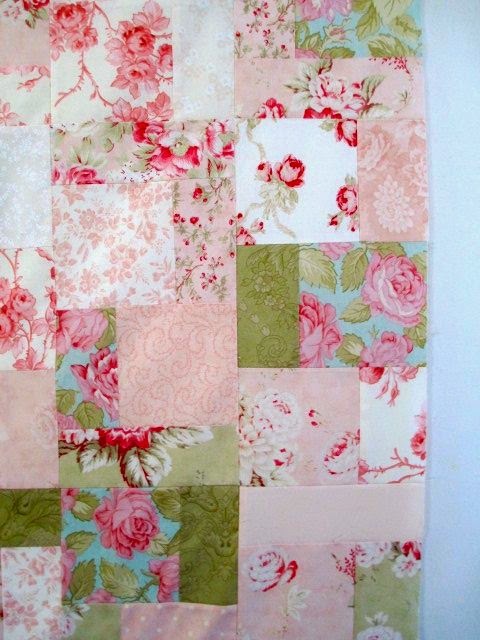 Details...This is the "Block Party" quilt I have on my blog under tutorials. 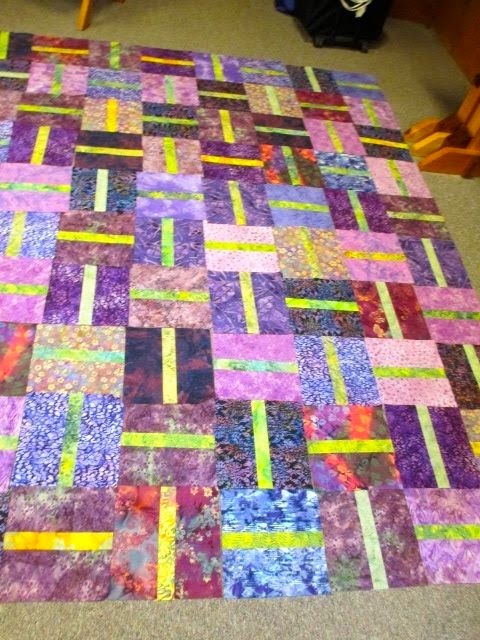 I've made this many times in the form of an I Spy quilt for children and most recently my granddaughter, how different it looks made up in this fabric. 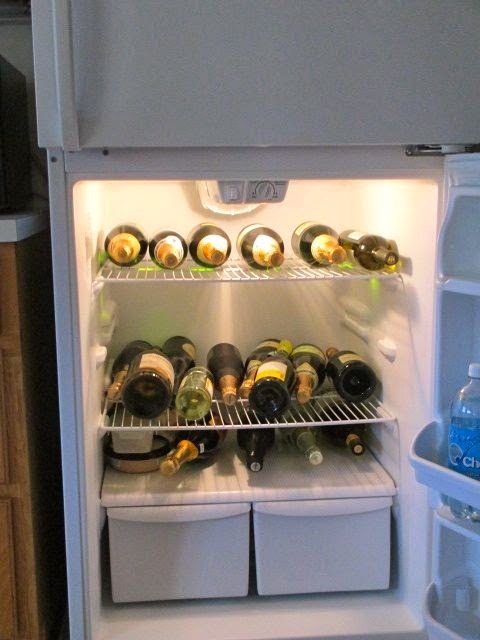 As the clock ticks towards 5:00, we look forward to Happy Hour back at the house. sitting around the table and answering our question for this retreat. This has become an annual tradition. We're given a question, we answer anonymously on paper - this year - advice our mothers gave us. 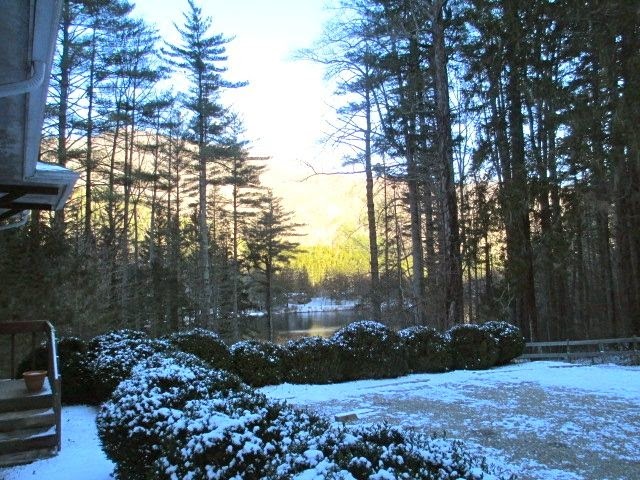 It snowed the second night and we woke up to this beautiful scene...not enough to get us stranded....too bad...we had enough fabric, food, wine and laughs to last another day...Already looking forward to next year.